The State of Florida requires one wearable Type I, II, III, or V PFD for each person aboard any vessel. Ensure PFDs are readily accessible. At least one Type IV (throwable device) PFD must be kept on board any vessel 16 feet or longer. Someone being towed behind a vessel must wear a PFD. All PWC occupants must be wearing their PFD while underway (not anchored or moored). In Florida, all boaters or passengers under 6 years of age onboard any vessel less than 26 feet in length must be wearing a U.S. Coast Guard-approved Type I, II, or III PFD while the vessel is underway in state waters. "Underway" is defined as anytime except when the vessel is anchored, moored, made fast to the shore, or aground. Florida law requires the owner and/or operator of a vessel is responsible to carry, store, maintain, and use the safety equipment required by the federal safety equipment requirements adopted by the U.S. Coast Guard. In Florida, it is against the law to operate a vessel while impaired by alcohol or other drugs. A vessel operator suspected of boating under the influence must submit to sobriety tests and a physical or chemical test to determine blood- or breath-alcohol content. A vessel operator with a blood- or breath-alcohol level at or above .08% is presumed to be under the influence. Any person under 21 years of age who is found to have a breath-alcohol level of .02% or higher and operates or is in actual physical control of a vessel is in violation of Florida law. This course must be completed following the date of the second violation, and proof of completion must be filed with the Commission's Boating and Waterways Section. Any person convicted of a boating infraction which resulted in a reportable boating accident or convicted of any criminal boating violation must complete any NASBLA/State of Florida-approved boating safety course and also complete an approved safe boating course for violators. Correspondence courses do not meet this requirement. The Florida Fish and Wildlife Conservation Commission (FWC) is responsible for regulating the state boating laws in Florida. All boats propelled by machinery, including gasoline, diesel and electric motors, and principally operated on Florida waters must be registered and issued a Florida Certificate of Number (Registration) by the Department of Highway Safety and Motor Vehicles. Vessels currently registered in another state and not kept in Florida for more than 90 consecutive days are not required to be registered in Florida. 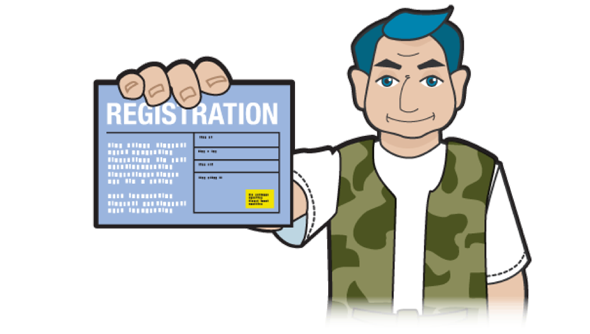 Successful registration results in a certificate of number, physical boat numbers and a decal. Be displayed on the port side within six inches, either before or after, of the registration numbers (as shown below). For example: FL 1234 BX or FL-1234-BX. This is a federal and state requirement. Manatees are protected by State and Federal law. Manatee protection zone requirements must be adhered to by all boaters. It is illegal to harass, hunt, or kill any marine mammal, including manatees. Anything that disrupts a manatee's normal behavior is a violation of law. Fines up to $50,000 and/or one year imprisonment may be administered to the person who disrupts the normal behavior of a manatee. Navigation charts identify sea grass beds as light green or marked as "grs" on the chart. Non-native aquatic species, plants, fish and animals are invading Florida's waters. These pests can increase dramatically under the right conditions, displacing native species, clogging waterways, and impacting navigation and recreation. Once introduced, they are nearly impossible to eliminate. Zebra Mussels are nuisance species that can be accidentally transported by recreational boaters when caught in propellers, intakes or attached to hulls. Empty bait buckets and remove any plant fragments from bait wells, fishing gear, trailers, dive gear, or props. Dispose on land into a garbage receptacle. Drain water from your motor, live wells, and bilge. Do not underestimate Personal Watercrafts (PWC)—they are very powerful for their small size and demand the same respect as any boat. In fact, PWC operation must adhere to the same rules and regulations as any other powerboat, including registration with the state and a B-1 class fire extinguisher aboard. Each person operating, riding on, or being towed behind a PWC must wear an approved non-inflatable Type I, II, III, or V personal flotation device (PFD). Inflatable personal flotation devices cannot be used for PWC operation. When towing skiers or someone riding a tube, etc, it is mandatory that an observer other than the operator be aboard the PWC or that a wide angle mirror is mounted on the PWC. 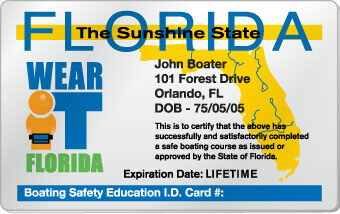 In the state of Florida, all PWC operators are required to attach the engine cut off switch lanyard (if equipped by the manufacturer) to his/her person, clothing, or PFD. Maneuvering a PWC by weaving through congested vessel traffic, jumping the wake of another vessel unreasonably close or when visibility around the vessel is obstructed, or swerving at the last possible moment to avoid collision are classified as reckless operation of a vessel (a first-degree misdemeanor). Operators should be aware of local ordinances; i.e., some zones on the waterways restrict PWC operation. Personal watercraft (PWC) cannot be operated from ½ hour after sunset to ½ hour before sunrise in Florida, even if navigation lights are used. Remember, both federal and state law requires the use of navigation lights from sunset to sunrise..
All those renting a PWC are required to be at least 18 years of age.